Boasting more than 465,000 square feet, the new Horseshoe Casino features 158,000 square feet of gaming space, which is comparable to any floor in Las Vegas and equivalent to the size of six football fields. Horseshoe’s major expansion project completely transformed its coveted location along Northwest Indiana’s lakefront and capitalizes on its’ 20 minute proximity to Chicago. The most amazing feature – it floats! The architect of record was Friedmutter Group, based out of Newport Beach, California who incorporated the elegant Las Vegas style onto the floating casino. The naval architecture for the world’s largest floating casino was designed and engineered by Lay, Pitman and Associates from Jacksonville, Florida. 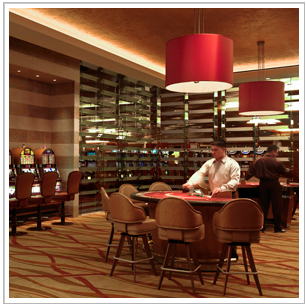 The Lay, Pitman group has become the premier floating casino designs with three nearby casinos on Lake Michigan and over twenty other designs nation wide. 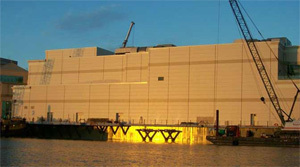 Based on a uniquely developed design concept utilizing modular construction, the facility consists of six barges, built at three shipyards and assembled on-site. Once the construction and outfitting was completed, the floating casino was moved into place and open within one week.